Yesterday I participated in the Amsterdam City Swim. This unique yearly swim event takes place in the historic center of Amsterdam. 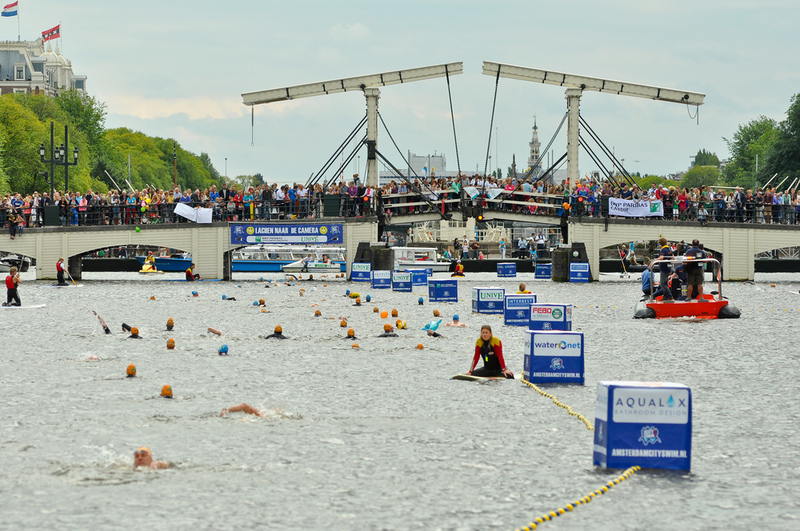 Over 2.000 swimmers swam this year 2.014 meters through the Amsterdam UNESCO canals. The event was initially created to raise money and awareness for the terrible ALS disease. The swimmers raised this edition over €1.9 million. The race started at 13 o'clock and I had to be there around 11 for registration. The swim is not a real race, but there are a group of professional athletes who race the swim. Amongst them are a bunch of Olympians including the world famous Pieter van den Hoogenband, who won 3 Olympic gold medals. This year Pepijn Smits (16!!) won in a time of 23:31 minutes, amazing performance. Van den Hoogenband finished 2nd in 24:41. I started in wave 5, with 400 swimmers already ahead of me. Most of the swim I had to slalom my way through the other swimmers. I finished 46th place overall in 32:50 minutes. At that time Van den Hoogenband was already showered and enjoying some well deserved beers.